In December the charity commissioned a study to look at how long it takes Veterans to reach out for mental health support. The results suggest that on average, they take four years* to come forward. Help For Heroes believe this is too long. The delay in Veterans reaching out is partly due to believing civilian services will not understand or support them (28%)* and a fear of being treated differently by friends (25%)*. Together, Help For Heroes helped 4,194 additional wounded, injured and sick individuals between August 2017 and August 2018. We know that for many, the wait was far longer than 4 years. They also know there are still thousands who are out there, struggling in silence and unable to come forward. 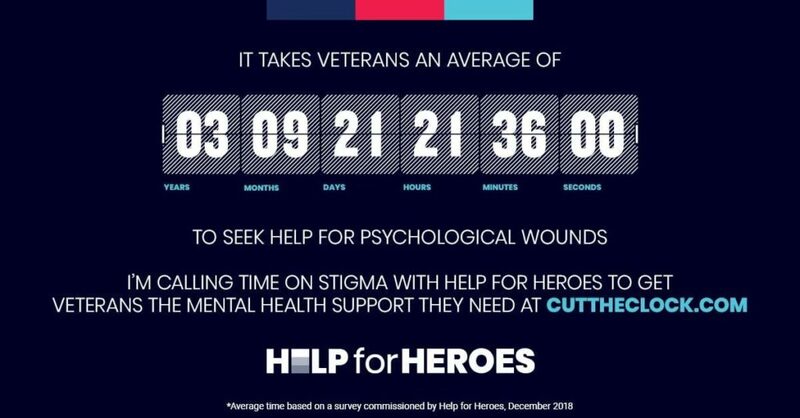 With your help, you can help cut this clock, reduce the time it’s taking Veterans to come forward and help end mental health stigma. Whether it’s by sharing the message with your friends and family, hosting your own fundraising event or donating – together we can call time on stigma.